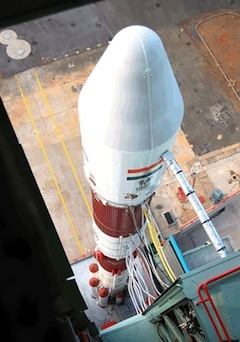 Achieving a booming success after two rocket failures last year, India deployed three satellites in orbit early Wednesday with the Polar Satellite Launch Vehicle, a workhorse 14-story booster that racked up its 17th straight successful mission. The PSLV thundered into a mostly sunny sky, soaring southeast from the launch site before turning nearly due south to reach a polar sun-synchronous orbit about 511 miles above Earth. 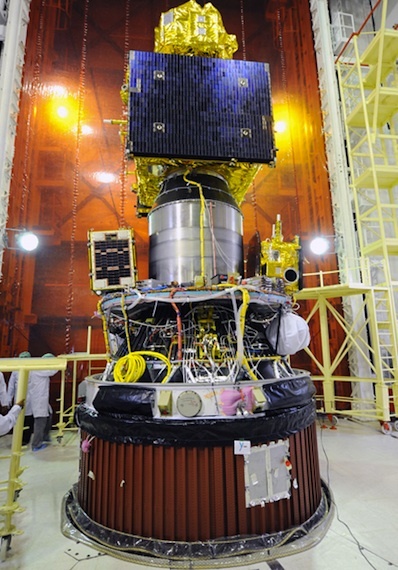 "I'm extremely happy to announce that the PSLV-C16/Resourcesat 2 mission is successful," said K. Radhakrishnan, chairman of the Indian Space Research Organization. Wednesday's rocket launch also orbited two smaller satellites - one for university students in India and Russia and another for Singapore.